Stock Medallions & Dog Tags are popular for sports teams and are sold complete with engraving. Sculptured raised sport medals and wreath holder medals are the most popular. 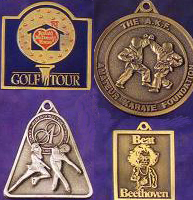 Almost any sport or activity can be depicted with medallions. A very classy way to recognize many people at the same time, at a relatively low individual cost. Medallions are popular among kids and adults.